It’s 1980. Let’s eat out! 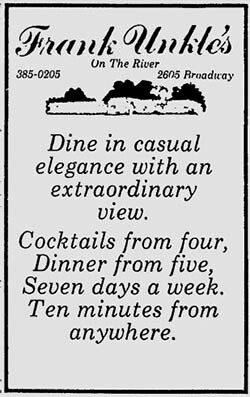 Once again The Blade’s archives have come through in a big way with another advertising-based supplement, this time about restaurants, from the year 1980. 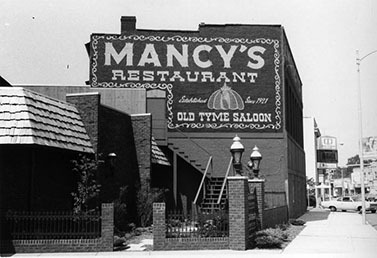 Toledo was a good place to eat out when I was a kid, and it still is. The rumor we always heard was that Toledo had the most restaurants per capita of any city in the U.S. Even the University of Toledo, on their “About Toledo” web page, mentions this rumor. I can’t verify that fact, though I can tell you there’s always someone in every city that says their city holds that title. Eater.com did a take in 2012 that didn’t mention Toledo in their restaurant list, but Toledo ranked fifth when it came to bars per capita. So Toledo is a good place to eat out…and drink. This particular section, from May 25, 1980, is about reader’s restaurant favorites. It was entirely written by Mary Alice Powell, the Blade’s long-time food writer and restaurant critic who still tosses a column or two The Blade’s way. A Frank Unkle’s ad from 1979. Well, according to the section, guess we should head down Broadway to Frank Unkle’s, which won two awards: Restaurant With The Most Romantic Setting, and Best Restaurant For That Special Evening Out When Price Is No Object. You could do a lot at Frank Unkle’s: drink champagne aboard the Arawanna II and have all-you-can-eat prime rib when you docked at the restaurant, sit on the balcony and watch the Maumee River, or have a $200 bottle of wine delivered by a sky diver (this happened, on average, three times a week). Prices ranged from $8.50 for liver and onions, chicken and ham steak, to $21.50 for three lobster tails. I cannot tell exactly when Frank Unkle’s closed, but it was possibly in the late 1990s (this Blade story notes the legendary bar owner Kip Diacou bought the former restaurant and turned it into the Lighthouse Cafe in 1999). Eventually the Toledo Zoo bought the site, at 2605 Broadway, in 2015 and converted the 14,000-square-foot building into their administration offices. a fire on August 14, 1973 which caused nearly $1 million in damage. 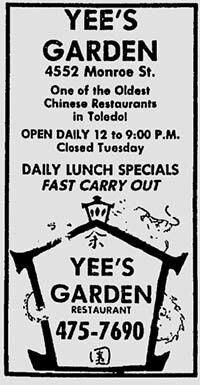 A Yee’s Garden ad from 1985. Best Chinese was voted Mark Pi’s China Gate, across from Lasalle’s on Secor Road. All well and good, but for my money Yee’s Garden on Monroe Street (east of Secor, if I recall correctly) was much better. The restaurant, run by Robert and Sue Yee, moved to Monroe and Harvest and closed in 2000 (Robert’s obit). Dyer’s won for best seafood, no surprise there. In 1980 it was in its prime. Dyer’s started in 1905, and kept its front window lobster tank going as long as it could – 76 years – at its 216 N. Superior location until it closed in 1993 after a slow, steady decline. Here is a fun little link with a 1956 Dyer’s menu, when a lobster dinner, $2.25, could be washed down with a 25-cent bottle of Buckeye Beer. Even in 1980, dinners still averaged $7 to $9. Capt. Billy’s Whizz Bang, on Mellwood at Laskey Rd., finished second. The Willows, 4844 Monroe St., won for best business lunch. 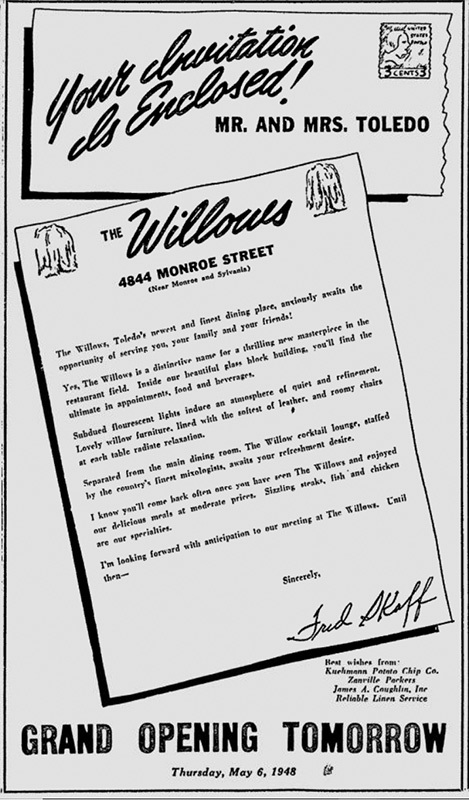 The Willows opened in 1948, according to this ad I stumbled across, but I can’t tell when it closed. There were a number of good roadhouse-type restaurants out that way including Arne Nissan’s Tivoli (long gone, I’m told there’s a Hooters there now), and Krotzer’s Steak House (which was still open on my 21st birthday in 1984 since that’s where we went). 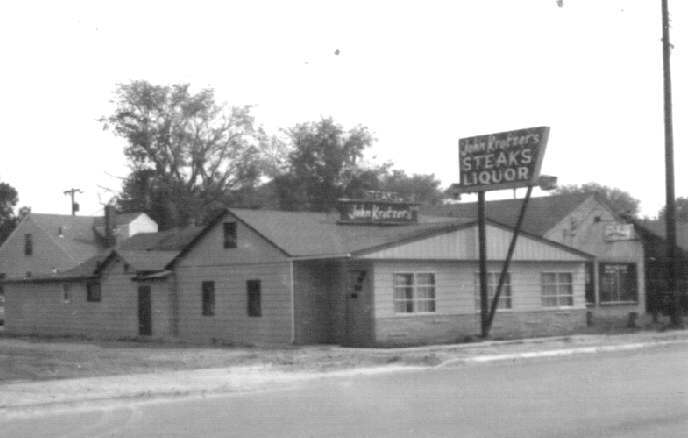 Krotzer’s Steak House, 4782 Monroe Street, date unknown. From the block card collection of the Toledo-Lucas County Public Library, obtained from http://images2.toledolibrary.org/. But it is difficult to pinpoint when these places opened, or closed. Some, like 1980 Best Mexican Restaurant Loma Linda’s, and Tony Packo’s (Best Ethnic Restaurant, Other Than Chinese and Mexican) are still open (though, as I have stated elsewhere on this site, Rudy’s Hot Dog rules). Also, Wendy’s and McDonald’s were named Best For a Quick Meal. Not White Tower? Boooo. They did buy an ad, however, and there are so many great ads in this section – Joey’s Supper Club (closed 1996), 4E Ranch House (closed 2003), Someplace Else, the Sylvania mainstay (where I took my junior prom date), Bassett’s Gourmet Restaurant at Westgate (still operating nearby as a health food store), Holland House (home of the Moronburger), Bud & Luke (Hello Friend), the fabulous Charcoal House (next to Orchard Drugs on Talmadge Rd. north of Sylvania Ave.). 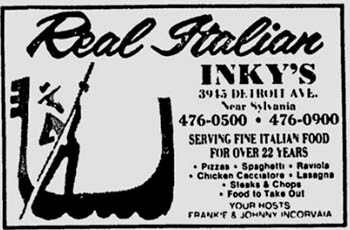 An Inky’s ad from 1980. But there’s always that one place that holds a special grip, isn’t there? That place for me is Inky’s, 3945 N. Detroit (at Sylvania Ave.), 419-476-0500 (and while I did go check, I can still type in the address and phone number with certainty even though I haven’t actually lived in Toledo in thirty years). I was bowled over to see stories from The Blade and WTOL about their 60th anniversary in August, 2017. I started going there when I was in the womb, I’m told, and although I’ve never had anything there except pizza, Italian salad and a Molson or two (ok, root beer as a kid), every time I go back Inky’s is a mandatory stop. When I was a kid, it wasn’t a trip to Raceway Park, win or lose (usually lose), without a stop at Inky’s afterwards. I never tasted a pizza anywhere like theirs, and trust me, I’ve eaten a lot of pizza trying to find it. Note: If you found this article interesting, here is another Blade section, this one from 1985, with lots of restaurant listings and advertisements. I remember Yee’s from the mid-1950s when I was a little kid. My parents would take my sister and I to Yee’s every Sunday. I recall the the original Yee’s was located in an old wood storefront building on the north side of Monroe Street, east of Auburn and west of the viaduct that crossed Monroe west of Swayne Field. The interior was, to a little kid, dark and and a little mysterious! Bob was a wonderful host and to this day I remember waitresses Vicky and Mary and the scoop of peppermint ice cream with chocolate sauce that I always had for dessert! I’m looking for a photo of Captain Wizzbang with the hammerhead shark hanging outside. It’s a very fond memory for someone special and I’m trying to surprise him. I’ve located a recent photo of it closed down, but no shark. Looking for the hammerhead shark!!! Hey, Rosa – I too am looking for a picture of the restaurant with the shark for a friend… perhaps we are looking for the same guy? Rob Tucker from Toledo.